Join me now on the Savvy Living Community. If you already joined the Frugal Living Community in the past, you’re already a member. Ebates and Blog Frog gave me the honor of being one of their Savvy Travel Experts and help spread the word about this innovative site that combines information and a friendly atmosphere to create the ultimate social networking and shopping site. Of course I will be a part of the community chats, but I’ll also be hosting a few of my own over the summer. We had a great one last month on saving on your summer travel and I would love to get my co-hosts together and do another one soon. Of course, if you want to get in on a discussion in the meantime, you can join in any of the current ones, including the one I have going on how you commemorate your travels. Check it out and get involved! Are you a member of Ebates yet? If not, you will totally want to do it. 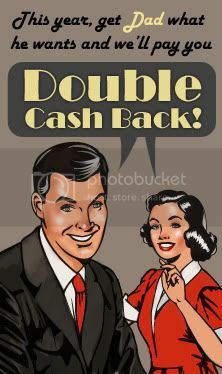 Get cash back for any of the stores you shop at that participate in the Ebates program. It's simple! Sign up for FREE and then click through the merchant link on Ebates to track your order and get the specified percentage of cash back after your order has been processed. Then you get your Big Fat Payment each quarter, which can be paid by check or via Paypal. It's like getting extra bonus discounts. Plus, if there are valid promo codes, Ebates will list them for you to copy and use on your purchase. Chose from hundreds of stores, including a long list of online travel merchants! And right now there are a dozen stores offering double cash back for dads and grads, but I see a few that can be used for travel purposes, too!